You must have wondered what it takes to get that stunning eye expression, which will make any man kneel down in your legs. Well, the secret has been revealed – get some more eyelashes. There are three basic approaches, which will help you achieve the look you have dreamed of. The first and easiest one would be to get an extra set of eyelashes. Those are sold at pretty much every beauty shop and the good think is that they can be applied at home without any extensive preparation. Another advantage is that they can be used many times, so this is definitely a cost-effective solution. 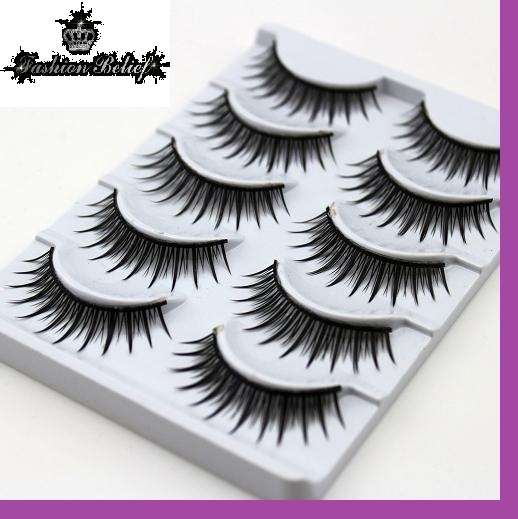 The second possible approach is to get some bundles of artificial lashes and add them to the natural ones. Now, this procedure can also be performed at home, you need some proper adhesive and some extra care. Note that if you are uncertain about it, you should use the services of a professional, the whole procedure in the beauty salon would be around 15 minutes, while the effect will be from a good few weeks to a couple of months. In case you decide to do that at home, make sure you are using either colorless or black adhesive. The third solution is by far the trickiest one; however the effect is the best. It is based on adding artificial lashes to your natural ones one by one. The whole procedure is performed by a beauty professional and takes up to one hour, however, the effect will stay on for months in a row, so it is an hour well spent! The lashes come in three lengths – short, medium and long. So, let us take a closer look at the procedure for the third technique. Even though this cannot be classified as rocket science, some preparatory training is recommended, so look for a suitable beauty studio, which does offer such course. The steps are easy enough, but they need to be followed precisely. You start by adding some adhesive, a strong one, to the natural eyelashes, and then you add an artificial one. The next is simple repetition. Even though the adhesive is pretty strong it does not cause any irritations, so no worries about that. In conclusion, we would like to touch a bit on the topic of the curly lashes. So, what does the procedure include? Before we take a closer look, please note that using a clip can break your eyelashes, so a mini roll is a much better solution. So, start by placing the mini roll on the eyelid. Attach the lashes to it using a special adhesive. Once you have placed them, add some perm liquid and let it do the magic for about 15 minutes. Another 5 minutes will be needed to properly fix the lashes. Once done, apply a special product, which removes the adhesive and makes the eyelashes unwind off the roll. Since the procedure will be best executed in a beauty salon, you may utilize the time by getting a face mask while your eyelids are being taken care of. In case you decide that you would rather save the costs for the beauty studio, you can buy a home set; however remember that the procedure requires extra care and attention.